What’s new in paranormal news? I am going to try to do two of these a month. This one was reported just today on a local television news station in my home state of New Mexico. New Mexico is known for UFO’s because of an UFO crash site that has become known as the “Roswell Incident”. On the evening of July 2, 1947 several Roswell, New Mexico residents witnessed what they described as an “disc-shaped object moving quickly in a northwesterly direction through the sky”. The next morning on a ranch located in the tiny community of Corona, New Mexico 30 miles north of Roswell a ranch foreman, Mac Brazel rode out with a young neighbor boy to move some sheep from one pasture to the next. These two came upon a strange debris field that held--various size chunks of a metallic material that were scattered from a hilltop down into an arroyo. At first, it looked to Brazel as if an aircraft had exploded. He had heard something the night before that sounded like an explosion. But since it had happened during a rainstorm he couldn’t be sure. He stated this sound wasn't like thunder. Brazel dismounted and picked up several pieces from this debris field. He had never seen anything like it. These metallic pieces were extremely light and extremely tough. What Brazel found that morning in 1947 was officially declared a downed “Weather Balloon” and any who dared to differ were silenced. For the next thirty years everyone who was directly connected to the Roswell Incident knew this was a lie. When a reporter tried to re-investigate this case in the early 1950s--these witnesses were warned again that it would be best not to tell him anything. By the mid 1970s this mystery started to unravel. 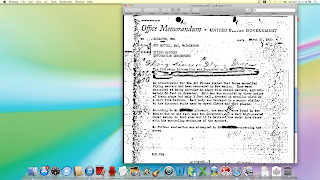 Stanton T. Freidman interviewed two witnesses to the incident and cover-up separately. One was an Albuquerque radio station employee who witnessed, "the muzzling of a reporter and the shutting down of an in-progress Teletype news story about the incident". The other person was an Army Air Force Intelligence officer Major Jesse A. Marcel, who led the recovery operation. Just like Mac Brazel, Marcel stated flatly that the material in the debris field was of “unearthly origin”. The Roswell Incident is considered the most important UFO case in history. Many people have investigated it over the years. In various pockets of New Mexico where people have relatives or friends that knew the witnesses-- it is a given that this incident was covered-up. The story that was aired today on a local television station in Albuquerque talks about a declassified memo on the FBI website that millions of people have read since it became available in April of 2011. This memo, entitled “Flying Saucers, Information Concerning” was written in March of 1950 by Guy Hottell who was the Special Agent in charge of the FBI’s Washington D.C. field office at the time. There were three flying saucer crashes. They were circular in shape with raised centers, approximately 50 feet in diameter. Three bodies of human shape, but only 3 feet tall, dressed in metallic cloth of a very fine texture, occupied each saucer. The memo goes on to state that they believed the crash happened because there was a US government "high-powered radar set up" in the area that interfered with the controlling mechanisms in the saucers. Today the FBI concludes this memo is not the “smoking gun” that UFO’s exist. Then why were all the people in Roswell, Corona and Albuquerque pressured into silence? “The Sun” is a daily national paper in the U.K. This newspaper is a tabloid that has “a reputation for running stories based on few facts”. So in October of 2009 when they published a story about a theme park called “Thorpe Park” being haunted, I just enjoyed the story. This article stated Thorpe Park, located in Chertsey, Surrey England, had just opened a new thrill ride, called Saw for the Halloween season. This gruesome new attraction was based upon the grisly 2004 film Saw of the same name. Late one night after the park closed to visitors, six members’ of the staff had taken a Ouija board on this rollercoaster and held a session. Their bosses spooked at what resulted from this "innocent fun" * suspended these six because unexplained activity had started to occur. Guests reported feeling a deep chill as they entered the building attached to this attraction. 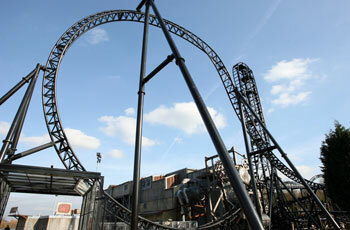 Employees reported that the ride’s “special effects” would turn back on after they had been turned off for the night. Doors were heard slamming shut and footsteps were heard in this area after the park was closed. The park brought a priest in to investigate. It was their hope that this man, a Reverend Fanthrope, the U.K.’s leading authority on the unexplained, would be able to solve this mystery or do an exorcism if necessary. This article mentioned that the ride had not been closed. “Fright Nights” would continue as planned. The six park employees who were suspended were awaiting reinstatement once the results of the inquiry were in. Now fast forward to “the rest of the story” as Paul Harvey would say. 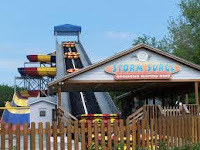 In 2011, Thorpe Park broke ground for their latest attraction, a water slide, called Storm Surge. It was discovered that beneath this area lay an ancient burial ground. When the construction began, the trouble began. The witnesses this time where “matter of fact” construction workers who spotted a strange apparition--the ghost of a monk. This group of construction workers didn’t care about the park’s profits. Park staff started to report strange incidents at the same time. Items were moved without cause and several felt a strong chill. This time mainstream media conducted an interview with the park’s Divisional Director, Mike Vallis. It was discovered the area where this 64 foot tall ride was being placed was once known as, “Monks Walk”. In this area was the footpath, which had connected Thorpe Church to Chertsey Abbey. The park brought in a paranormal group from southwest London to investigate. The park then had a geophysical expert examine the site. Peter Masters from Cranfield University picked up “signature readings” which were similar to that of a burial ground or an old building site. After these investigations Thorpe Park decided to build their new Storm Surge attraction in another area of the park. This was at considerable cost. The new site was smaller and the ride had to be redesigned. Was this just another marketing ploy or did the builders really think the site was haunted? You decide. * Ouija boards are not innocent fun, they open portals. Recently, a haunted mirror sold on eBay for $150 American dollars. The two British men who sold it claimed it had brought them bad luck. It seems their landlord threw it out and they fished it out of a dumpster near their London home and placed it on a wall. A short five months later they were trying to get rid of it--with the disclaimer that it was haunted. These two claimed that they had experienced financial difficulties and illness since acquiring this mirror. They had both been awakened in the middle of the night by “screaming pain”, and both of them had felt a strong “sense of impending doom”. They saw flickering shadows reflected within this mirror and one stated he had woken up covered in “deep red scratches”. Of course many supposed “haunted items” are sold on eBay each year but this story is fascinating because it actually is similar to several documented cases involving haunted mirrors. Here is a link to a news story about this haunted mirror. For generations people have been fascinated by reflective surfaces. Because of this many folktales and legends were created. Mirrors are connected to “portals”. I wrote about this connection in another post here. Here are more superstitions or “do nots” in relationship to mirrors. For mirrors are believed to pose dire risks. If a person is in bed and ill in a room all the mirrors should be covered. The reason for this is when a person is venerable a mirror if it is a portal can take their soul. People should never look into a mirror at night or by candlelight. The reason for this is because you might see a ghost or even your own death. This one I mentioned in my other post. When a person dies in a room all the mirrors should be covered or turned toward the wall. The reason for this is so the dead person’s soul does not become lost in a portal. When a person is sleeping they should cover all the mirrors in the room. The reason for this is so a negative energy cannot attack them. Along with this it is said that a person should never place their bed in a way that a mirror can reflect it. Finally, a person should move their mirrors to different areas of the room. The reason for this is so spirits or ghosts cannot use it as a portal. The above are if course superstitions. But here are some documented cases of how people acquired mirrors--that then caused them paranormal problems. There are mirrors that should be avoided. Don’t buy or place old mirrors in you home. If a previous owner to the home you rent or buy leaves a mirror or mirrors behind--get rid of them. If a mirror has been used for any kind of spiritual work e.g. divination or scrying get rid of them because these practices supposedly open portals. People who do this for a profession cleanse of do some kind of ritual with these mirrors in order to protect themselves. Using a Ouija board can open a portal. If there is a mirror nearby it can become the host for this portal. Finally, many places that are reputed to be haunted, such as old hotels, have mirrors that are portals. I have never encountered "a portal" but I find this information interesting. Catherine Howard became the fifth wife of the tudor King Henry VIII. She was born in 1521 into a prestigious Catholic family. 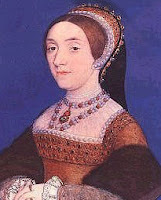 Her first cousin Anne Boleyn, the niece of the Duke of Norfolk was King Henry VIII’s second wife. Unfortunately, Catherine's fate was to be similar to her cousins. Catherine’s mother died when she was young so she was sent to live in the house of Agnes, with the Dowager Duchess who basically ignored her. Her education was neglected and she could barely read or write. Because of this neglect, Catherine had a freedom most young woman of noble birth at that time were not allowed. She became flirtatious and impetuous which resulted in illicit relationships with young men. She had an innocent relationship at the age of 15 with her music teacher, Henry Mannox. She then took a gentleman’s usher by the name Francis Dereham as her first lover. When the Dowager was informed of Catherine’s behavior she was horrified. Instead of blaming herself she had Catherine whipped. The Duke of Norfolk decided that his young niece who was admired for her beauty should be sent to court to advance the families’ fortunes. She was sent to Hampton Court to be a lady-in waiting. Just as the Duke had hoped she attracted the eye of King Henry VIII. 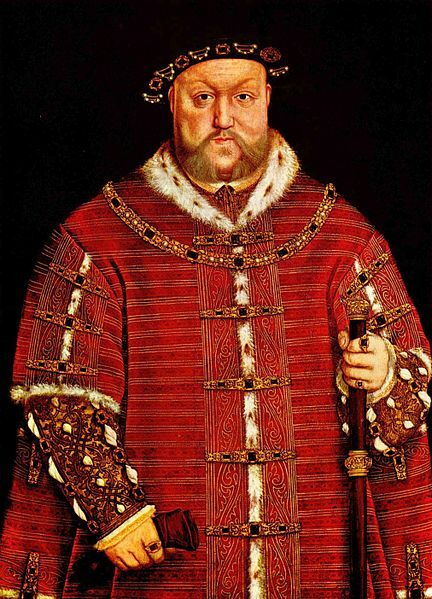 Henry became obsessed with Catherine. Thinking she was all that was pure and good he started to think of her as his “rose without thorn”. Catherine was indeed sweet and kind but she was not innocent. At first she didn’t mind the difference in their ages--she was 19 he was 49. She liked the fine clothes and jewels that Henry provided. Catherine married Henry in 1540. But it wasn’t long before her soiled past started to catch up with her. She was forced to give former members of the Dowager Duchesses’ household positions at Court in return for their silence. Not long after her marriage, still promiscuous, Catherine started a new affair. A young courtier, Thomas Culpepper whose duties were to attend to all of Henry’s intimate needs became her lover. Jane Rochford a lady-in waiting who had played a part in Queen Anne Boleyn’s downfall encouraged this affair between Catherine and Culpepper. Their affair quickly became known at court. At first, Henry would not listen to these rumors. But the Protestant Archbishop of Canterbury, Thomas Cramner built a case against the young Catholic Queen. 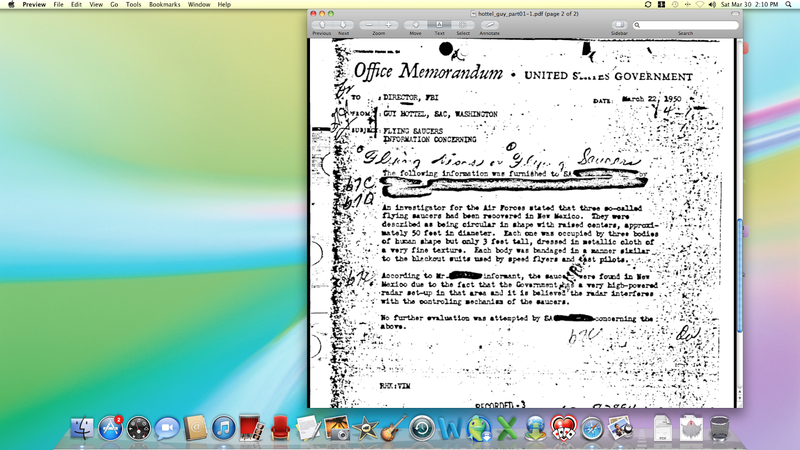 His evidence included information about her affairs while at Agnes and love letters that she had written to Culpepper. Henry devastated banned Catherine from his presence and ordered she be arrested. 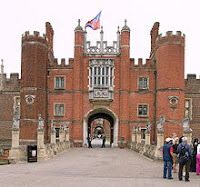 Catherine was confined to her apartments at Hampton Court for adultery. She escaped at one point and tried to find Henry to plead for her life. But she was dragged back screaming to her rooms. Catherine’s former lovers, Mannox, Dereham and Culpepper were tortured and executed. She passed their gruesome impaled heads on London Bridge on her way to the Tower of London. She was beheaded in February of 1542 at the age of 21. After the executioner chopped off her head with an axe he held it up for the crowd to see. She would have remained alive for eight seconds after her head was removed from her body because it takes that long for the lack of oxygen to cause unconsciousness and death. So Catherine most likely saw her own headless body when this was done. Catherine Howard’s ghost haunts two places. She is seen in the area where she was kept awaiting execution at the Tower of London and at Hampton Court Palace where she lived with King Henry VIII. Her ghost has become known as "The Screaming Lady of the Haunted Gallery". Since her death, she has been seen running through the Hampton gallery for it was here she was dragged back to her rooms after attempting to plead for her life. She is known as an anniversary ghost for her apparition is seen in this area on the date she was put under arrest. Her ghostly hand is also seen floating near the portrait of her in this gallery. Many visitors to this Haunted Gallery over the years have stated that they sensed something not quite right about this area. "Grace- of- favor" residents in nearby apartments report hearing her screams in the gallery. One radio interview that was being conducted in this area had to shut down when their equipment stopped working. In 1999, two female visitors to Hampton Court each on separate tours a half hour apart fainted at the same exact spot in this gallery. In 2000 psychologists from the University of Hertfordshire concluded from their investigation that all the witnesses to this activity over the years experienced it in the same areas. 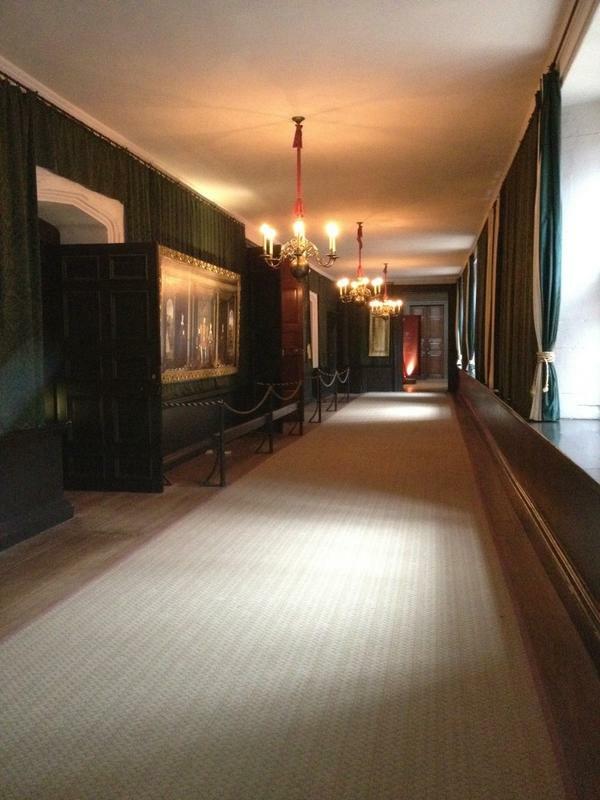 Hampton Court Palace has many other ghosts that haunt it as well. In future posts I will share their stories. Even King Henry VIII’s ghost has been seen but not at Hampton Court. His ghost is seen at Windsor Castle.